Have you ever attended a Lego BrickFair? 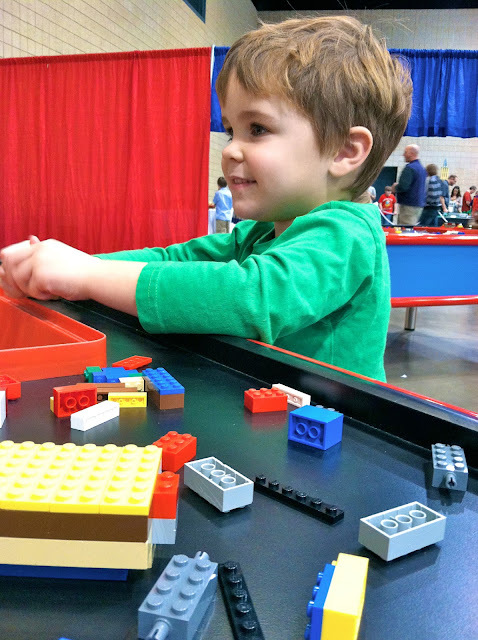 Last Saturday and Sunday, BrickFair came to Birmingham, and I took Nathaniel, Nick and Jake down to experience it. I have to admit, it was pretty amazing. The detail work on the creations was mind-blowing, and hardly anything there was built from kits. Almost everything was designed by the builders themselves, who ranged in age from 8 to probably 78. 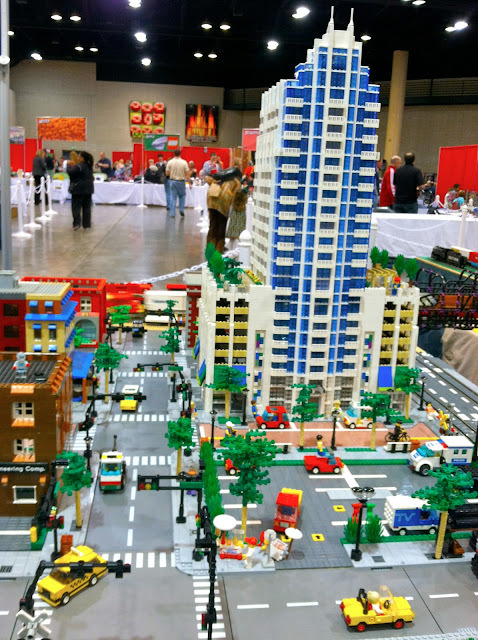 Each builder sat with his or her creation all day and answered questions about them ... I was surprised by how many questions the boys asked. They weren't very shy! We saw a lot of cityscapes, and LOTS of trains, which were powered by electricity. I only had my phone with me, so I couldn't get great pictures, but I thought this city park was really cute. There was even a couple getting married there at the bottom left corner! One of the most impressive ones was a Star Wars ship that was built in layers so you could see the inside of the ship. It must have been six feet long and two-and-a-half feet wide at its widest point ... I think the builder said that it contained $3,000 worth of Legos. My PERSONAL favorite was this beachside RV park scene featuring surf equipment, a picnic area, a playground and a swimming pool! I'm telling you, I nearly fainted over that swimming pool. I thought it was the cutest Lego thing ever. But not far from the RV park, we came upon the Military section, and then I had a new favorite: the Vietnam creation. It had two working helicopters ... the rotors are blurry because they were spinning, and there were so many tiny details, down to a monkey high in a treetop. And if you were paying close attention, you'd see that it was built as a cutaway model, so you could see into the underground bunker or whatever that's called. I was fascinated. The boys just couldn't get enough ... they didn't want to stop looking at models -- unless it was to shop. And I did spend about $20 on each of them, because they were SO inspired by what they saw, they couldn't wait to get home and build some new things of their own. One area of the floor was sectioned off for building, so even though it was GERM CENTRAL in there, I let them hunker down at a table to play. They got down to business quickly and built steadily for about 45 minutes. Finally, when I decided that they'd spent enough time at the petri dish table, I announced that it was time to head out. Of course as we walked out, we had to stop and admire some of the creations that had had longer lines when we first arrived. Jake just LOVED the ones that included trains that whizzed by every minute or so. 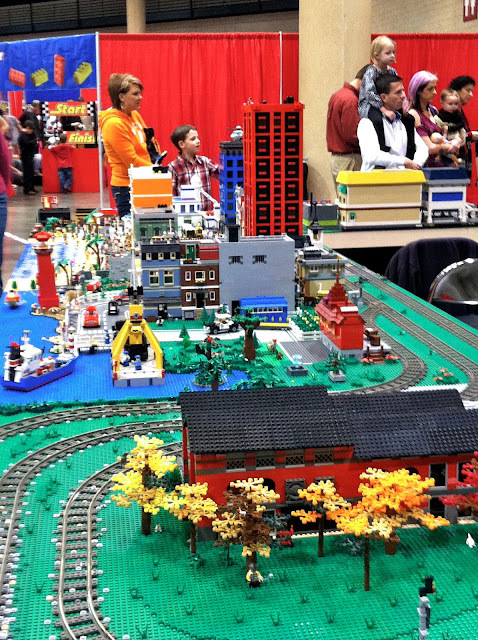 If you have a Lego Lover in your house and BrickFair comes anywhere near you, I'd highly recommend that you go. I'm quite sure I won't be able to avoid it now that the boys know about it ... they'll want to go back annually. And that's fine ... I probably had almost as much fun as they did. ALMOST.